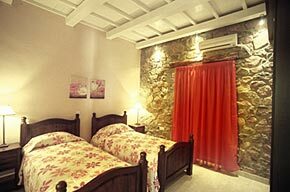 Villa Fillio is located on the west coast of Crete about half way between the world famous beaches of Elafonisi and Fallasarna and roughly 10 kilometres from the pretty mountain villages of Elos and Kefali. This is magnificent unspoiled genuine Greek Island mountain countryside, with no recognition of tourism anywhere nearby. 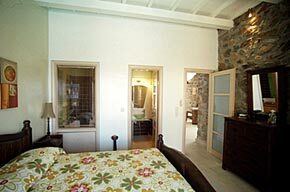 The house is in a tiny hamlet, and is built on a rocky outcrop overlooking the beautiful clear blue sea. Much of the beach is rock and pebbles here so the surf and its sound is evocatively beautiful and the water fresh and sparkling clean. There are around twenty houses in the hamlet in total so one feels alone but not lonely. In the centre of the hamlet is a group of six houses, all built in recent years, of which Fillio is one. These beautiful holiday houses blend local materials and traditional craftsmanship with the very latest in both building techniques and interior design and style. Approached from a lane, Fillio has its own private entrance at the side end of a broad sweeping terrace that runs the width of the house and garden - all of which faces the sea. The first swimming pool is on this first section of terrace and the second pool at the far end of the terrace on the other side of the house. The pools are therefore completely out of sight of each other and indeed anyone else - since neither the terrace nor the pools are overlooked by other buildings, or roads, or pathways etc. This is indeed a very private place. This theme of privacy runs into the house itself. There are two bedrooms, a twin and a double, each with its own en-suite bathroom and they are both at the rear and either side of the house - their huge patio doors open out privately onto their respective pools and terrace areas. 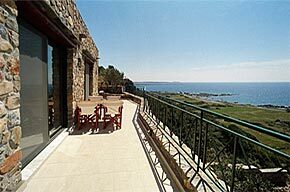 The sitting room, dining room and kitchen run across the full width of the house at the front and have huge full height sliding windows that look across the terrace to the sea below and to the island of Elafonisi to the south. 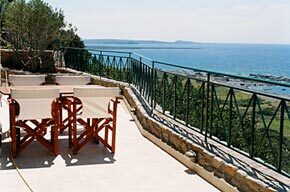 The d�cor and interior styling of Villa Fillio is truly spectacular and a romantic delight. Great thought and care has gone into choice of room layout, furnishings, textures and colour schemes. 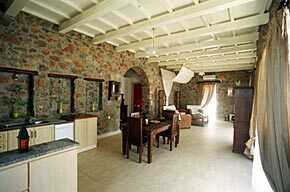 The house is fully equipped for all year round occupation and features air-conditioning, satellite television, a whirlpool/jacuzzi style bath, washing machine, microwave and full-size conventional cooker and so on. Villa Fillio is for those who want to get completely away from the crowds and retreat into luxury - not at all for those who want the hustle and bustle of shops and tourists or who need others to entertain them in the evenings. The house is private but not completely isolated. There is a mini-market just two hundred metres away and the Cretan Kitchen there will be happy to cook meals to order and deliver them to you on days when you really don�t want to do anything at all! 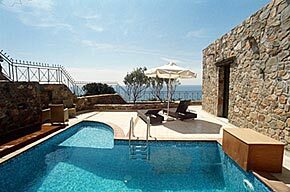 Villa Fillio is a perfect haven for two couples travelling together, or for a couple with two children, or perhaps for a couple for who want to pamper themselves in warm, romantic, private luxury!